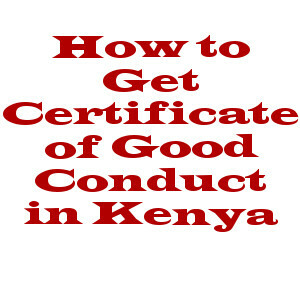 Obtaining the certificate of Good Conduct in Kenya is pretty easy. All you need is yourself, your national identity card, Ksh. 1,000, about an hour of your time (if in Nairobi) to rush to the CID headquarters and a three weeks waiting period. Certificate of good conduct is a requirement in almost all government institutions and as well as none government institutions when seeking for certain services or hunting for job. The certificate of good conduct confirms that the holder has not engaged in criminal activities for the preceding 6 months and has not served any jail term. Requirements to acquire certificate of good conduct for Kenyans. You must be 18 years and above to apply for one. You must be having a second generation national Identity Card. A clear photocopy of the national ID is as well needed. If below 18 years of age, one must have an original birth certificate and a clear copy of the birth certificate. Fee of Kshs 1,050 . Your fingerprints should be visible i.e not interfered with. From eCitizen portal, you need to download and print two copies of the invoice. You are required to also download and print fingerprint form (C24) from eCitizen portal. Requirements to acquire certificate of good contact for foreigners. National Identity card. Do not bother making a copy; you will do this at the CID offices because they have a particular way of printing the copy is such a way that the finger prints are legible. An extra Ksh. 10 for the photocopy. It does not hurt to bring more coins for the boiled maize, pineapple or a banana at the gate on your way out. Tissue or wet wipes to wipe your fingers after you are done. There is a stern warning that if you smudge the walls you will pay for the repainting. Make your way to Odeon and board a Matatu number 100. They are outside Tuskys just opposite KCB Tom Mboya branch. The first stop is the Cash office where you need to pay the Ksh 1,000. You will be issued with a receipt and on it is the collection date. You will then be directed inside where you will make copies of the receipt and the ID card. The last stop is the form’s submission. The form is stamped and so is your copy of the receipt. If you were applying for a job, you can now take the receipt to your employer as you wait for the certificate in exactly 3 weeks. Now wipe your fingers, buy boiled maize (mutungo) on your way out and have a lovely day. You can apply for the Good Conduct certificate and pay for it online. Payments can be made via mobile money, debit and credit Cards. Click on ‘Get Service Now’ under the Directorate of Criminal Investigations tab. Select the applicable age (adult or below 18 yrs), read the instructions carefully then fill the application form. During the submission you need the following: TWO copies of the invoice you get after paying online and ONE copy of the downloaded C24 printed on Both sides of an A4 paper. You need to go in person to have your finger prints taken. Original Identity card and its Photocopy or Birth Certificate & its copy for applicants under 18 years. Ensure you are using your own eCitizen account while applying for the Good Conduct Certificate. Applications made on behalf of others will be automatically rejected. During submission you must carry with you the original documents and photocopies of the same. Once your Certificate is ready, you’ll receive an SMS directing you on how to get and download it. You will need your original ID and 1000 Kenyan shillings for processing. Make the payment and get a receipt before proceeding to the photocopy and fingerprinting centers. At the end, you will be given a copy of the receipt with the collection date. Use this receipt to collect your certificate. What if you are in Mombasa? Is the CID headquarters open on Saturdays ? If it is to get your certificate, me thinks not. It is a government institution and we know they do not open on weekends. Is the certificate just valid for one year? I got my certificate in 2013. Do i need to reapply again? do i have to follow all the steps as a first applicant or its easier? Valuaable info…..Now wipe your fingers, buy boiled maize (mutungo) on your way out and have a lovely day. Pretty tasty..
do I have to go back to CID t collect the certificate? or will it be posted? You do need to go back to collect it. They will. We're heading in the right direction. Can i renew my certificate? how can that be done if one is out of the country for sometime? I applied for certificate 3wks ago… But on the receipt they av idicated that im suposst to collect 28th which 4wks from the date of application…. On ur system I can see its 3wks…..is their a probability of it being ready today.. I go to check?? Its needed urgently….. How can u help me? I have lost my receipt, what can I do to collect my certificate? The receipt you get normally has the date when your certificate will be ready. what does one require when renewing his/her good conduct cert? Hey..can i apply for it on saturdays? i applied certificate of conduct on 10th august 2016, how can i check the status coz i went to cid they told me they have not recieve. Update this Blog. the process has changed dramatically. You can't just go show yourself at CID HQs…you need an ecitizen account and pay by MPESA. and if an alien or resident you have to physically go to Nairobi twice! if required to do Malindi change anything? from what the police station told me I nead to send my passapoero ID and residence in original to Nairobi police HQ, you can confirm this. What do you do when you just lost one? I collected mine today but I have unfortunately lost it with all the attachments i.e. the invoice & the finger print forms I guess. Can I have one re-generated instead of going through the whole process all over again? I am Burundian by Nationality and I lived in Kenya where I did part of my studies. I am currently residing in Burundi and I was in need of the Police Clearance Certificate and so I was wondering if I can apply for this document online or I have to travel to Kenya in order to obtain it. Please advise me and thank you in advance for your reply. Very useful info there modern mum, I'm headed out there tomorrow, I must taste the 'mutungo' Thanks! I applied for a certificate of good conduct for myself on 02nd Nov 2016 which is 3 weeks now. i have not gotten it yet but why is it that a person applied on 8th Nov 2016 and has already gotten his certificate? do i have to bribe to get mine fast? Can one apply with the waiting card? why do we have to attend Nairobi twice! for an alien or resident in Mombasa this is a waste of time and expensive. I and my wife had spent more than 6 months in Kenya and thus need Police clearance certificate. We have all documents except for Aliens Card or work permit(as I am employed by Indian company working in Kenya and I attended Kenya for meetings / consultancy only. I did not work there or draw any income there). Unfortunately this was 5 years old when we exit Kenya and Aliens card is lost. Hallo! What are the operations hours? Do you operate on Saturdays? They are just enlightening us on the 'How-To' process. They don't work there lol….Visit the CID HQ website! For those who are not in Nairobi, can't they apply online and visit the Divisional CID headquarters for finger prints? I lost my receipt can I collect with my ID? Or am I required to pay again? how do you renew your certificate of good conduct? this is a question that has been asked severally with no answer.